October’s First Friday and Artwalk weekend was busy, busy, busy! The weather, although warm, held out and Gallery Row was packed. 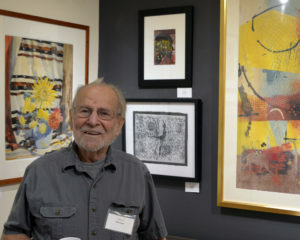 We are celebrating the life and work of artist Mitch Lyons! 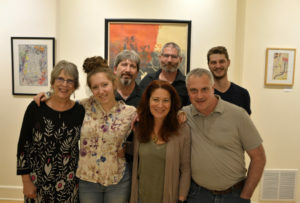 Although we are terribly sad that he passed away in March, it was a special night with his family, who all showed up to see this final show of his work, both clay pots and his signature clay monoprints. We are also raising money to support the “Mitch Lyons Clay Scholarship Fund. This $500 annual scholarship will be given to a deserving clay high school student in Lancaster County. If you would like to donate to this cause please go to www.gofundme.com/mitch-lyons-clay-scholarship-fund. Definitely stop down to see the show!